Shadowpact is kind of like sweet-and-sour sauce. There's a lot here that's very good (the characters, specifically) and then there's quite a bit that's kind of blah--not as bad as, say, Bilson and DeMeo's Flash run, but just kind of unexceptional. Fortunately, not everything tends to go wrong with Shadowpact at the same time, carrying the story well enough to it's conclusion and making me fairly likely to purchase the next volume. It's hard for me to rectify Bill Willingham's Fables work with the work he's done recently mainstream DC Comics, essentially Robin and Shadowpact. Willingham's Day of Vengeance preserved Fables' intrigue and fluid storytelling, perhaps because of it's short, contained story. Shadowpact, however, shares Robin's short, choppy scenes, as well as its penchant for one-note bad guys that seem more like filler than threats. Whereas Fables is distinctly imaginative, Shadowpact shines in fits and starts. 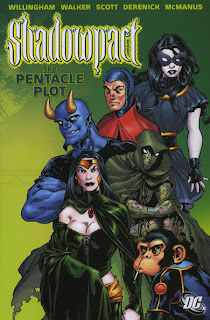 "The Pentacle Plot" storyline from which this Shadowpact trade takes its name actually only covers the first two or three issues of the book; the rest concerns the Shadowpact team recovering from a year-long absence and fighting mystical threats sent by a new enemy. The first plotline is as interesting as the second is mundane; "Pentacle" features interesting enemies with intriguing ties to the heroes, while the rest of the trade offers forgettable, one-note villains. "Pentacle" is indeed worth the price of the trade, but don't expect "Pentacle"'s quality to last throughout. Willingham himself draws the "Pentacle" storyline well, but I was fairly relieved to see that he wouldn't be drawing Shadowpact by himself throughout. Willingham has a tendency, especially in the first issue, to draw what he writes--that is, Superman essentially remarks, "I'll have to use my heat vision" as the panel shows him using his heat vision, or Blue Devil says, "I'll punch this guy" as he punches someone. This tendency is a shame, because Willingham's animated art probably suits Shadowpact best of all the artists in this trade, though the later, more realistic art works well especially on Blue Devil. What keeps bringing me back to Shadowpact, however, are the characters. It's a joy to see Blue Devil featured in a comic again, and Willingham portrays Ragman as a wonderful everyman. Detective Chimp doesn't get much airtime in this trade, but kudos to Willingham for revitalizing both Chimp and Rex the Wonder Dog in such workable ways. I enjoy the fact that Willingham writes a team of heroes who are second-tier, but no less serious about their hero-ing; the plot may lag, but there's nothing wrong with Willingham's writing of these characters. The camaraderie and "spirit," if you will, of these heroes makes me want to keep reading them, even despite the flaws in the trade. From the realms of magic to outer space ... tune in for some Green Lantern reviews coming up.